It's hard to beat the versatility of a pashmina when it comes to mixing up or topping off your outfit, but quality and pricing vary widely. In an ideal world, your perfect wrap would be beautiful, affordable, soft, durable and, of course, eco-conscious. Sound like an impossible list? Not for Jasmine Fullman. Jasmine began her business, called Naturally Knotty, by making eco-friendly baby bags. Before long, she realized that her technique of integrating factory scraps, factory overstock and recycled/renewable materials could easily be expanded into other accessories. We discovered Naturally Knotty's 100% bamboo pashminas on TreeHugger, which described them as something you'll love so much, you'll want to order one in every color. Of course, the naturally renewable resource of bamboo is a great idea in theory, but how does it hold up in practice? We recruited two of our Facebook fans to test the wraps, and Leanne Winn and Lorraine Mulligan Ryan confirmed that in addition to being vibrant and soft, these beautiful wraps didn't suffer from pilling or fading. Now that's practical eco-chic! Who wants to be KNOTTY today!?! Well Naturally Knotty that is…did you know in China knots represent Peace, Prosperity and Friendship? Mix that mantra together with our fashion accessories made from natural fibers such as Bamboo and there you have it “Naturally Knotty!! We are thrilled and honored to be featured on Daily Grommet feel free to browse and see our fabulous bamboo wraps perfect for any and every opportunity. These wraps are large – pashmina style wraps perfectly bundled up in a hand carved actual bamboo stalk tube…how perfect is that! If you didn’t know bamboo is the fastest growing grass and can shoot up to 1 yard a day! Incredibly soft you would think you are wrapping yourself up in cashmere but the best part is our wrap is washing machine friendly and bamboo fiber is extremely breathable, keeping you warm at night and chilled throughout the day. What a WRAP! The perfect gift…for the hostess, bride/maids, man, woman or child! So bring it on...the one time where KNOTTY IS NICE! Welcome to our new site everyone! It's fitting that today's Grommet comes wrapped in such beautiful packaging. Beautiful presentation really sets a product apart and we hope that our new site's presentation will make each Grommet shine even more. If you have any questions about the new site or about these beautiful wraps, please let us know! It was so exciting to have Lorraine and Leanne from our Facebook community joining in the Grommet-testing fun! Thrilled they had the chance to get their hands on these gorgeous wraps and really get that personal experience. Looking forward to having more of our community members participate in the discovery process of future Grommets! 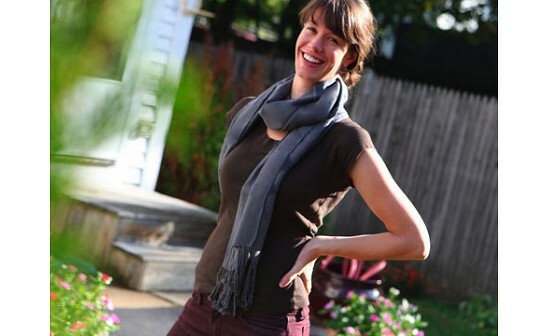 Beautiful scarves and beautiful site Grommet people! 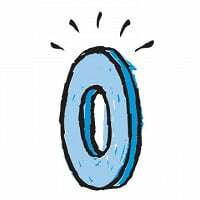 I was fortunate enough to be invited to be a tester for The Daily Grommet this month. The product was to be a surprise and, boy, was It! 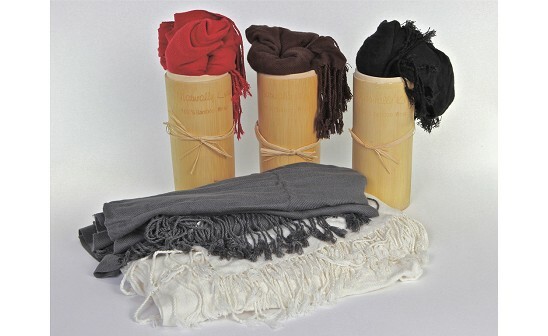 A luxuriously soft pashmina wrap made of 100% bamboo. Warm, cozy, soft as butter, true in color (mine was black and it was dark and rich) washable, eco-friendly, in a gorgeous reusable cylindrical bamboo box with a signature raffia knot. What more could a girl ask for? How about affordable? Based on my years of experience selling items like this, I guessed an affordable $46.00. Well, it's $29.95. I brought my wrap to a social dinner, and got positive feedback from the 13 guests, the women AND the men. I took it on a business/leisure trip to Ohio, and it didn't wrinkle in my case. I wore it with a skirt, and also with jeans. I got lots of unsolicited compliments from the desk clerk to the waiter. I loaned it to a friend at the "Life is Good" festival and she loved it, and while it was lightweight enough to carry in my purse, it kept Susanne Hallisey warm at the concert. Then I washed it, and the color and shape stayed true. I toted it all over the place. Well made, functional, attractive and beautifully packaged. Wrap On! @Leanne Winn: Your husband shares your good taste! ;) Happy Holidays to you as well! It's hard to beat the versatility of a pashmina when it comes to mixing up or topping off your outfit, but quality and pricing vary widely. In an ideal world, your perfect wrap would be beautiful, affordable, soft, durable and, of course, eco-conscious. Sound like an impossible list? Not for Jasmine Fullman.